In February, the US State Department held a public meeting in Washington, DC of interested stakeholders to discuss and strategize the creation of an international surrogacy enabling agreement. The meeting participants were overwhelmingly from the fertility industry and its supporters: surrogacy clinics, attorneys, brokers, ASRM (American Society for Reproductive Medicine – the fertility industry’s lobbying arm), and sympathetic academics. The discussion was dominated by surrogacy attorney extraordinaire Steve Snyder of Minnesota, and John Weltman, owner of Circle Surrogacy in Boston, a gay man who has used a surrogate. Tellingly, the two State Department employees who ran the meeting, Michael Coffee and Lisa Vogel, clearly knew the industry people and were on a first-name basis with them. A vocal non-US participant was Australia’s most prominent surrogacy attorney Stephen Page. When a couple of the professors mentioned human rights and exploitation, I, as a radical feminist, was the only person who directly spoke out against surrogacy as pure class exploitation, endangerment of women’s health, a violation of women’s and children’s human rights, and the commodification of women and children. 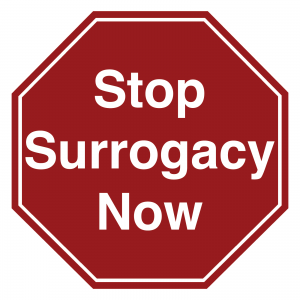 The industry chorus sang in unison about American exceptionalism as applied to surrogacy: surrogacy functions wonderfully in the United States, surrogates aren’t exploited here, they all have incomes between $40,000 and $100,000 (! ), they are “counseled,” they have their own legal representation, and are well educated. In sum, the US is a virtual heaven on earth for surrogates. Not only is this blatantly false, it is manipulative and contrary to an objective process of analysis. All of these industry stakeholders – attorneys/American Bar Association (ABA), brokers, clinics, and the ASRM – are profiteers who should not even be consulted since they possess an inherent conflict of interest regarding surrogacy. In fact, the very same month the State Department public meeting was held, the ABA adopted a resolution on the Hague Convention on private international law concerning children, including surrogacy, urging the State Department to exclude human rights considerations, ignore the Hague Convention on the Protection of Children, not impose restrictions or regulation, and treat surrogacy solely on the basis of “intent-based parentage.” The resolution reflects an approach that protects the wealthy intended parents and the industry that profits from them while ignoring the human rights, dignity, and well-being of the women being used as brood mares and of the children commodified as products for sale. As if there could be any doubt as to whose interests the US government is serving, Lisa Vogel, the leader of the US delegation to the Hague Conference of Experts, blatantly asked the industry representatives who dominated the meeting how to make the case to other countries for an international surrogacy enabling agreement based on the US “exceptionalist” model of surrogacy in all its forms. The only disagreement expressed at the meeting concerned whether a treaty should be based on adoption law. The main priority of the industry and its US government partner is determining the best way to ensure enforceable contracts and establishing citizenship for the children in the intended parents’ (buyers’) home country. In summation, it was like an industry convention with the US government there to serve its interests. Consider this a clarion call! 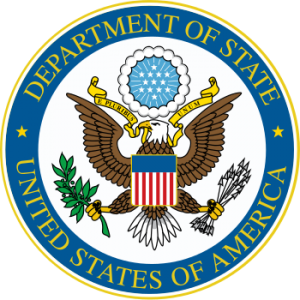 The State Department is holding another public meeting to discuss a questionnaire prepared by the Permanent Bureau of the Hague Conference on Private International Law on international parentage and surrogacy. The purpose of the meeting is to obtain the views of concerned stakeholders on the questions presented in the questionnaire. A copy of the questions will be provided to meeting participants. YOU CAN PARTICIPATE BY PHONE, you do not have to go to Washington. To participate by phone, email pil@state.gov to obtain the call-in number and other information. You may also submit comments to Michael Coffee at coffeems@state.gov. If you wish to attend the meeting in person, contact kathysloan128@gmail.com for details. In March 2015, the Council on General Affairs and Policy of the Hague Conference decided that an Experts’ Group should be convened to explore the feasibility of advancing private international law issues surrounding the status of children, including surrogacy. In preparation for the second meeting of the Experts’ Group, the Permanent Bureau circulated a questionnaire seeking ideas and views from members of the Experts’ Group. This is why the US State Department is holding this public meeting. Do not let the profit-driven fertility industry in collusion with the US government steamroll an international treaty legalizing and facilitating the creation of a global breeder class of marginalized women for the wealthy and children created as products for sale. Make your voice heard on 13 September!